When my uncle passed away recently I decided to setup a memorial Facebook Group for him. Facebook groups are different from public pages in that they are not public like regular Facebook pages (though you can set them up to be public). I created a “secret” group which enables me to keep the group private to just a few people that I invite. Facebook groups do many things Facebook pages do that I thought would be good for the memorial page. Cover photo, links, text, photos, and videos can all be added. The combination of these elements lets you build a full picture of the person you are memorializing. You don’t need to take the full burden of creating the group. The way the group works is that anyone can post and upload photos, the eulogy, scrapbook items, family tree, etc. You can also assign administrators. I plan on building out more groups for other family members. Why don’t you create one today? When two people I know died and I witnessed the online support of friends and family that followed, I realized that social media can create a sort of digital cemetery. In real life, visiting a cemetery can be a social activity. 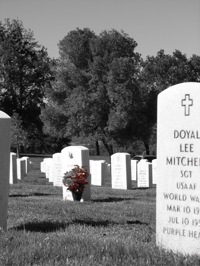 With social media Web sites like Facebook, activities like visiting a cemetery can be mimicked. When you create a Facebook Group, you enable family and friends to share stories, photos, and discuss the deceased person with others. With the United States being so large and people spread out in cities all over the world, it can be challenging to visit a cemetery. Like other tasks with social media, visiting a digital cemetery is very fast. Where else can you visit a cemertery 24 hours a day, seven days a week? Certainly visiting a digital cemetery isn’t scary at night. While the permanency of Web sites can be debated, there’s no reason to assume a digital cemetery should be any less permanent than a real one. Gravestones in real cemeteries wear out and the text can become illegible. Placed flowers will wilt and die. Digital flowers and text never get blown away, discolored or vandalized. All digital cemeteries need are a Web host and a miniscule amount of storage space for photos and text. Social media sites enable you to have so much more than a gravestone. You can present a photo of the deceased person as they looked in their prime. You can support causes the deceased person supported in life, like the Red Cross. You can post video, literally bringing the person back to life. A co-worker of mine was murdered in 2009. Friends built him a Facebook Group page, and my company asked my to build a custom blog where employees could share stories. On the blog I linked to the Facebook group, and the Facebook group linked to blog I created. Friends also created a Facebook Group to help track down the murderer. I encourage you to create a Facebook Group or similar site for passed loved ones. Harness the evergreen capabilities of the Web to honor people you care about and create a lasting impression of someone’s life. Do you know the major social media sites have policies regarding death? Do you know what to do with the online profiles of family members and close friends that pass away? After one of my blog readers responded to my “touching” blog post it seemed the digital death topic needed a second look after some social media death policies surfaced. In the case of Facebook, profiles of the deceased drop out of search. The profile can be memorialized, but if you want to leave a legacy you are going to need plans to keep a website operational after death. In fact, a lot of planning will need to be done if you want to exist online after death. Just like when planning your own funeral, you need to leave someone in charge of caring for your digital life after death. Facebook offers to close or memorialize the profile of a departed user upon proof of death, depending on what the user wanted, or what the family decides. Proof of death includes a copy of the death certificate, and proof that you are the executor, or representative of the deceased estate. When a Facebook member is memorialized, only current ‘friends’ can leave condolence messages and the profile cannot be found via search. Facebook will not allow you access to the users profile, only for memorialization. Twitter allows a family or the executor to close the account, and they receive an archive of all the deceased’s tweets. Your full name, email address, and your relationship to the deceased. The username of the account holder. A copy or link to a published obituary. Further information: Twitter deceased user policy. LinkedIn allows you to close a users account by filling out their verification of death form. However, this form requires an email address registered to the deceased member’s account. Without this important piece of information, they will not be able to address your request. Years of messages are left on email servers. They should not go abandoned. In fact, some of my favorite reads include Jack Kerouac: Selected Letters Volume 1 and Jack Kerouac: Selected Letters Volume 2 edited by my University of Connecticut Professor Ann Charters. There’s something dreamy about reading someone’s interactions and correspondence with others. Especially when it was written long ago. Hotmail: Hotmail will send you a disc that contains all of the deceased’s contacts, emails, etc. However, they will absolutely not give you access to the account. They will close the account if the family member requests it be closed. An address to send data. A ‘power of attorney’ or proof of executorship, and proof of relation. A copy of the deceased’s driver’s license or other ID. Full name, address and date of birth of the deceased. The estimated date of account conception. The last estimated sign in date. NOTE: the Hotmail / Microsoft death policy is not able to be found online anymore. Some online discussion boards posit that inactivity will automatically delete the account. Yahoo: Yahoo is the strictest in its death policies. Thanks to William Eve and his blogazine team at Life Insurance Finder for researching the policies. Some interesting articles and infographics on digital death can be found on their blogazine. Can you live forever online without lifting a finger from the grave? There are some artificial intelligence tools that can make it happen. That Can be My Next Tweet is a service which allows your Twitter profile to go on tweeting after you’re dead. It analyses the DNA of your past tweets, to create short sentences and updates which, even if they don’t make a lot of sense, still sound a lot like you. Hunch is a program which can access your Facebook and Twitter accounts to predict how you will answer a series of questions. Currently Hunch has an accuracy rating of 83% in the US, and 75% outside of the US. With an 83% accuracy rating in 2011. NOTE: Hunch seems to have disappeared! There are probably similar tools. …an executive training program called Apple University that Jobs considered vital to the company’s future: Teaching Apple executives to think like him. Five states have laws governing some degree of online access after death and there are several proponents pushing for a nation-wide standard governing use of your online properties after you pass. Hi ken. We wanted to create a memorial page for love ones but he didn’t have any Facebook account. If we create a page in what category? I created a group called a “memorial group.” Maybe there is something similar for a page. Hi Ken, very good and insightful article, thank-you for posting. When creating a Group page for a deceased loved one what category do you recommend using? I was planning to use “Community” but wan’t sure if there were implications to doing so or whether another option was preferred. Thanks in advance for any feedback. Hi Heath. The group category is “Secret” since I didn’t want everyone to see it publicly.